- No Garden, no toilets, so when the West toilets were closed around 7.45PM we had to go to the East toilets completely on the opposite side (the original location of "The Garden"), a stressful 30 minute trip! Paulywaul obtained a feedback form here [www.iorr.org] - feel free to use it! According to feedback on page 28 refunds are bow being processed by Frontgate (ticket agent for the BST site) with both fees (10%) and shipping (up to £90 international, £30 for shipping and £59,80 for "Delivery International mail" ) being refunded to those who made the request. AEG have not commented on suggestions made to improve the situation such as Marquee's map (see below) but are maintaining a hard line in some answers like the one received by IGTBA : "Thanks for your constructive feedback and response. Unfortunately the previous e-mail is the best that we can offer in this situation and the official response from AEG. Please let us know whether you would like a full refund on your ticket, or a downgrade to the GA ticket price within 3 business days." One member, kernowmod, made a complaint to his credit card company (Barclaycard), who "very helpful they agreed that AEG have failed to supply what was promised, I may not get the plan changed, but someone is going to have to [tell] me why. AEG have started getting back to people who requested a refund, asking them to provide their order number and the name of the ticket agent they used. No word yet on the next steps of the process and whether they will be refunding the 10% service fees and postage (£30 for international orders). The story has been picked up by The Telegraph : Rolling Stones fans in row over premium tickets. Although some people were given a 3 day deadline by M. Rob Hallett ( rob@aeglive.co.uk ) President of International Touring at AEG Live (the promoters of the BSC Festival) to decide whether they wanted a refund/downgrade/upgrade (for pay upgrade not offered to all), further requests for clarification have not been answered since last night. The original description in the "Tickets" sections has been added below, previously we had a screen capture of the purchase page, the content is the same. It should also be noted that there is now mention of "The Garden" an area exclusive to T1/T2 holders with food, drinks and toilets. "The Garden" had never been mentioned before, which could only encourage potential buyers to get the "Unwind Backstage Bar" for an extra £100 to get access to such essential services. 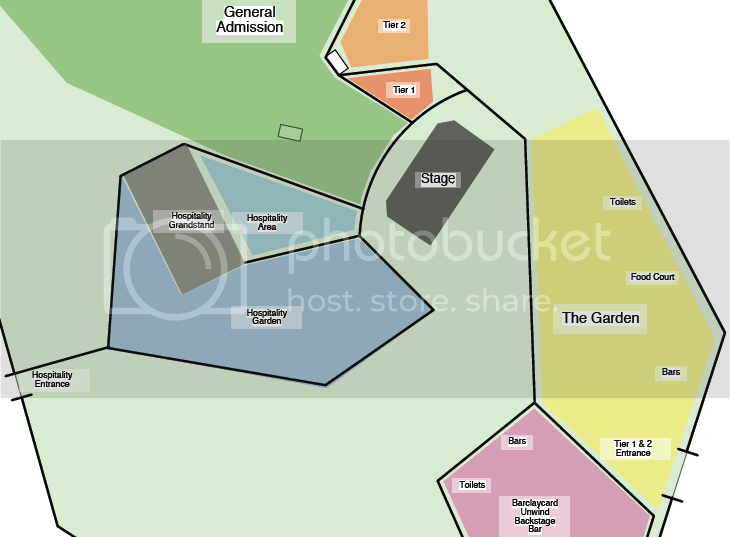 As seen on the map, "The Garden" is in fact located closer to T1 and T2 than the "Unwind Backstage Bar"! - inducing potential buyers to buy more expensive T1 and T2 tickets by using fraudulent descriptions of T1/T2/T3 placement. - inducing potential T1 and T2 buyers to purchase the "Unwind Backstage Bar" package for an extra £100 by not mentioning that its essential services like toilets, food and drinks came with standard T1 and T2 tickets in "The Garden". M. Rob Hallett, President of International Touring at AEG Live (the promoters of the BSC Festival), has now replied to emails sent to him inquiring as to what the actual setup will be at Hyde Park for the festival in view of the inconsistencies between what was written on the BSC site where the tickets were sold and the map published on the Rolling Stones twitter account and the information he gave to The Standard this morning. The same email (seen here: [www.iorr.org]) was sent to everyone and in summary, he does not acknowledge that T1 and T2 buyers were misled (the descriptions on the BST site have now been changed, see below) but nonetheless a full refund or a downgrade to T3 is offered. Apparently a decision has to be made within 3 days and at this point it is not clear whether the refund includes fees (10%) and shipping (£30 for international), since a "full refund" is mentioned, hopefully they do. Based on info received from the ticketing company it appears the map posted on the RS Twitter is a "fake" (their own words) and that there will indeed be T1 in the front, T2 behind it and then T3...an official confirmation has yet to ve made though. 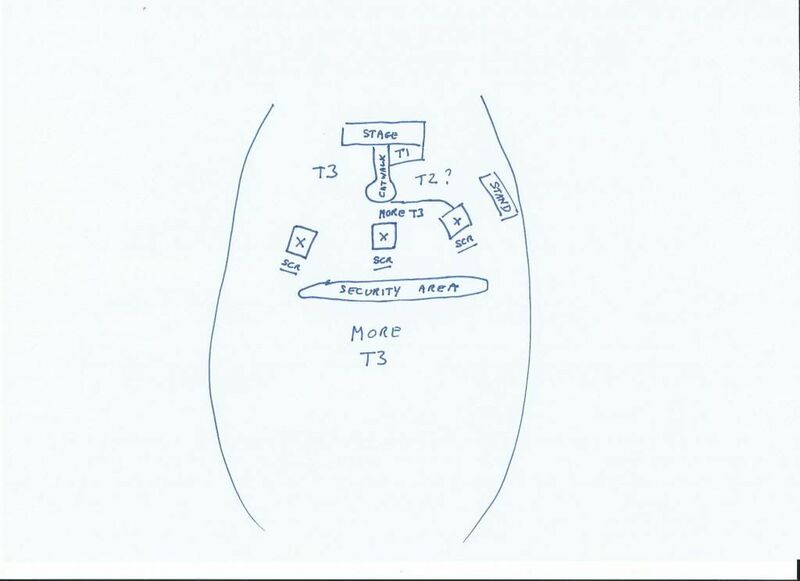 ORIGINAL POST : SUMMARY - Confusion on "Seating Chart" at Hyde Park ! Rip-off for Diamond/T1 and Gold/T2 Tickets ? Bon Jovi's setup, although it's not clear if it was for Hyde Park or their stadium tour. “The band wanted the regular ticket-holders to be right at the front of the stage staring at the whites of their eyes, not 200 yards away,” he said. So what gives ? Confusion, rip-off, both ? This needs to be clarified ASAP ! Edited 32 time(s). Last edit at 2013-07-11 20:31 by gotdablouse. Re: Summary of Confusion on "Seating Chart" at Hyde Park ! Rip-off for Diamond and Gold ? If this layout had been there pre the tickets actually going on sale, nobody would have bought anything apart from a £95 ticket. The tickets as sold are therefore a gross misrepresentation and should be refunded/exchanged. Re: Confusion on "Seating Chart" at Hyde Park ! Rip-off for Diamond and Gold ? Exactly, I will try sending a link to this summary to the journalist who wrote the Standard article, can someone who's on twitter post it on the Stones' twitter too ? Good idea but that link is not working for me ? Edited 1 time(s). Last edit at 2013-04-05 15:20 by arc-angel. 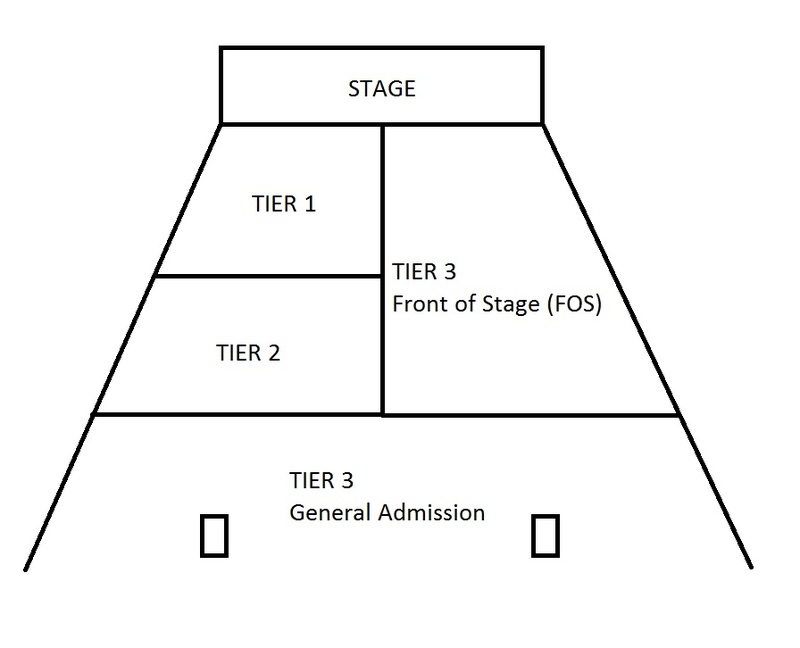 I have just seen a plan of the stage layout on Twitter.....where, exactly is the GA Tier 1 access to the area directly in front of the stage and where is the GA Tier 2 access to an area closer to the stage than general admission. I bought my £399 tickets expressly on the understanding that the description as advertised would be right in front of the stage, so exactly how does that tally with the stage layout on Twitter ? This is gross misrepresentation. I assume you will be offering everyone who bought Tier 1 and 2 tickets their money back. I think this wasn't the original plan. They changed it because of some controversy. And now ofcourse bigger controversy. They should do the same as Bon Jovi. I bought tickets that are closer to the stage than tier 3. So that's where I want to be on july 6 for £199. I don't want my money back though - I want what I paid for! They will have to revert to the earlier configuration, surely? Still allows Tier 3 people to get to the front, albeit at the sides. Yeah you are damn right! To keep everything in the same thread I will repost my comments from the Hyde Park thread. If this is the true layout, the only available option would be to cancel all the transactions, refund everyone's money and restart the ticket sale. The fact that no layout was provided before today, it was only natural that assumptions would be made that the layout would be the same as Bon Jovi the night before. The text on the BST ticket page would indicate this would be the case. The layout may be incorrect, but I believe the £299 tickets will end up being in the hospitality area. Disappointing for those hoping to get in on the action. They may end up mingling with the picnic munchers. Re: SUMMARY - Confusion on "Seating Chart" at Hyde Park ! Rip-off for Diamond and Gold Tix ? @BowieStone - What's that "some controversy" you're referring to? Did it occur when the BJ tickets went on sale ? I mean it's fine for them to want to change the BJ setup but the fact is they sold tickets under a false description starting on Wednesday, which is fraudulent. Edited 1 time(s). Last edit at 2013-04-05 15:25 by gotdablouse. For bv: can we get that thread highlighted at the top ? Journalists are watching this... yesterday they quoted a few posts from hear in an article (Daily mail). I guess having more visibility on this mess will help. I belive you are right, there should, paradoxically, also come some pressure from Viagogo et al since they are looking at great losses if this plan stays - which it should NOT. The people who have coughed up for hospitality packages will get looked after in a way they have never known before. That's an awfully presumptuous thing to say. How do they know how you guys have been looked after before? I have sent an email to arts@standard.co.uk explaining the situation and linking to this thread. Re: SUMMARY - Confusion on "Seating Chart" at Hyde Park ! Rip-off for Diamond/T1 and Gold/T2 Tickets ? 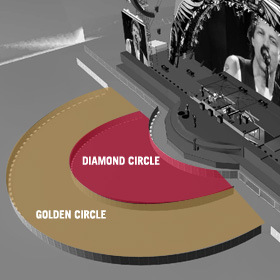 In my humble opinion, golden, platinum, diamond, etc circles are ridiculous for a rock n roll band. Being closer to the stage should be a matter of how early you arrive, not how much money you can afford to spend. Yes perhaps, but if at the time and point of sale it clearly states that there are such arrangements, then at the very least they should exist as described. This is not the case here, it is a case of blatant deceit !! Whether or not you think there should or should not be such layout is immaterial, the fact of the matter is that tickets were sold WITHOUT a layout diagram, but WITH a written description of what money bought what ticket and WHERE !! What has happened now is that with release of the layout diagram, it is clear that the written description of the different ticket price categories was misleading, in fact it was WHOLLY INACCURATE. THAT .... is fraud. THAT .... is wilful deceit, THAT .... is unacceptable. When you look at the picture you see white blocks from the hospitality area and the gold circle to the general admission section. I assume these are gates where you can enter the general admission area. So technically you have access to the area directly in front of the stage. How about those web pages reselling Tier 1 tickets at 10.000 gbp??? What will they do now??? OK, you might have ACCESS. But - what you do not have under the present schematic is anything that differentiates your £399 (or £299 if you exclude the backstage bar facility) from someone else's £95, THAT's what the complaint is !! Thanks to gotdablouse for starting this thread. Let's see them explain that bit. If the Stones were an airline company, the business and the first class would have the smaller seats.